In the summer of 1967, Richard Z. Chesnoff, Edward Klein and Robert Littell were all working as associate editors in Newsweek’s Foreign Department. 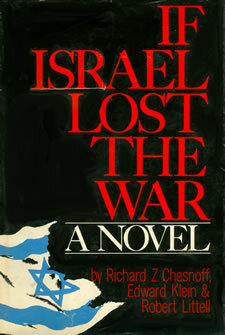 About ten days before the Arab-Israeli war began, Chesnoff-who had lived in Israel from 1957 to 1967 and spoke fluent Hebrew-was dispatched to Israel to cover the crisis. In the weeks that followed, he reported from all the battle-fronts and interviewed many of the Israeli leaders involved in the campaign. In New York, Klein and Littell were part of a Newsweek team assigned to write stories on the war itself and its aftermath-coverage that won for Newsweek an award from the Overseas Press Club in New York. What would have happened is the subject of this extraordinary dramatic narrative of a nightmare in the Middle East and its repercussions around the world. Beyond that, the book challenges-with compelling documentation-the conventional wisdom concerning American policy toward Israel-namely, that ultimately Israel’s survival is guaranteed by the United States. Mixing a tightly woven fabric of hard fact and plausible fiction, If Israel Lost The War goes behind the scenes and explores the decision-making process in the highest power centers from Washington to Moscow. It us a novel that cannot fail to shock, fascinate and forewarn.